Headquarted in the stunning municipality of Evry – just south of Paris – Aures was founded by Patrick Cathala in 1989. He remains CEO to this day. Having been listed on the EuroNext stock exchange since 1999 Aures has grown to establish a global presence with subsidiaries in the UK, Germany, Australia and the USA – and a network of distributors and resellers in over 75 countries. RMS is served in the UK by Aures Technologies Ltd. In 2018, Aures exceeded global sales of €100 million and have purchased RTG (Retail Technology Group) – a major player in the US POS market. In 2005, Aures launched the Odyssey – a vibrant and colourful EPOS that represented a shift in the market from purely practical devices to attractive EPOS systems that could add a flourish to the interior design of any shop. Since then, AURES’ creativity has been acknowledged by a number of Awards bodies, including IF Product Design Awards (late 2012), the Red Dot Awards 2013 (early 2013), together with an “Observeur du Design” label Award and a Good Design Award from the Chicago Athenaeum Design Museum (2014). By adding the popular, affordable and robust Aures Yuno to an Aures cash drawer, receipt printer and barcode scanner our Aures Yuno bundle is an ideal solution for most retailers. In addition to this, RMS offer finance so your bundle can be repaid affordably over 12, 24 or 36 months. This is a great opportunity to get an attractive, resilient and complete EPOS kit at an affordable monthly price. The Aures Nino is an ultra compact and flexible EPOS system that thrives in any environment where space is at a premium. Alongside an Aures scanner, Aures cash drawer and Aures reciept printer this Nino bundle gives you everything you need to succeed. At RMS, we offer finance so your bundle can be repaid affordably over 12, 24 or 36 months. For one affordable monthly price, this bundle gives space-savvy businesses everything they need. 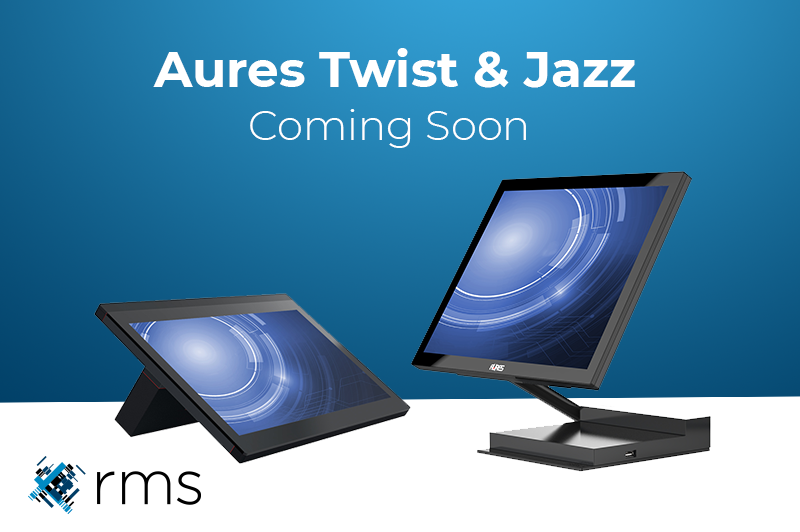 In 2019, Aures will add to its range of impressive EPOS hardware by introducing the JAZZ and the TWIST models. The JAZZ, with its ultra elegant and flexible design, will be a stand out in any retail environment while the TWIST with its angular, compact body and unique flippable design allows it to thrive in the busiest of retail and hospitality space. Aures At RMS, we’re the leading Aures provider in the UK. If you’re in the market for Aures’ attractive and resilient EPOS hardware RMS will aim to beat any genuine quote. Get in touch for further details.